blonde sagacity: Uplifting News...ACLU Smack Down! Tenesee's Munford High School had always started and ended their graduation with a student-lead prayer --that is until the ACLU told them they couldn't.
" Most of the audience stood, bowing their heads. 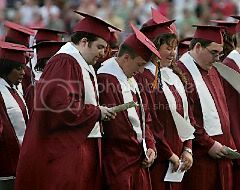 Then, most of the 286 graduating seniors pulled out laminated bookmarks and folded up pieces of paper that they had been given earlier and began reciting "The Lord's Prayer." Students said beforehand that they knew that the moment of silence would be their chance to speak. Once those in the audience realized what the students were doing, they broke into wild cheering as the silence in the football stadium was broken by the verses of the prayer. ACLU executive director Hedy Weinberg of Nashville could not be reached for comment after the graduation. Seventeen and eighteen year olds with heart and conviction...how refreshing. Howard Dean & Pat Robertson? Terror on the Rio Grande? ACLU Defeating its Own Purpose? What Would You Do if You Were Invisible...? Have Women Sunk So Low in Men's Regard? ...And This From A Muslim... A Must Read. Philly Cop Killer Finally Caught...(and Shot)! What Happens to "Moderate" Muslims? Is it Too Late for Europe? GO VOTE! It's "Clean Sweep" Day in PA! NYT Smoothing the Way for GOP Wins? Big Brother or Smart Policing...? There's More to Models Than a Pretty Face! National Guard on the Border? Comeon, How Can You Hate Bush...? Why Don't They Fear Us...?! Are You Reading From The Sandbox...? Are the New Armored Suits "Goofy"?